If there is no desire in a person’s heart, he falls asleep and is considered dead in spirituality. After all, spirituality begins when the desire awakens it. The desire never comes by itself. Even if a person is awakened from Above, and suddenly feels a longing in his heart, a strange desire—it is all on account of the Upper. Nothing but that will come to us from Above. Although it may seem to a person that he advances with the one desire that he was given as a present from Above, he cannot advance by himself. It will go away the same way it appeared, leaving almost no traces. We have to try and accurately clarify where our desire comes from. It can come from the group, from a friend, from an impression, from a certain event, or from a certain memory. A person attributes all this to himself because he doesn’t know and cannot feel that it comes from the outside. But he must calculate and check whether he was searching for it a moment before that, in tension, did he try to attain that desire? If there is nothing that ties the previous moment to the appearance of the desire, it means that it isn’t his, but that it simply passed through him and wasn’t registered on his account. This desire doesn’t bring him correction, but is rather like an exercise given to a child so that he will learn. But it is not considered part of one’s personal advancement. While an example together with his participation is enough for a child, for us it is not enough. All our advancement is only thanks to our own desire. This means that I have to exert myself with regard to my environment and the books in situations where I cannot do that and do not have any previous desire. It is from such situations that I have to try and somehow wake up. Here the habit of working according to a clear schedule is very important so that I know what I have to do now. Then I will remember and oblige myself to do it. This can also be thanks to the mutual guarantee in the group, which always reminds me of my obligation to myself and to others. I can get additional support if I build a system around me that constantly reminds me how important spirituality is and makes me search again. But even if I am reminded from Above in a way that I don’t understand, by “the direct and indirect influence of the Creator,” in the hidden ways as the Creator operates—I still have to continue by myself afterwards until I discover my own desire. Who Are You Working For, Pharaoh? Question: For quite some time now during The Zohar lesson I feel as if I am trying to find the right wave of a radio station, but I only hear noises. We constantly speak about the fact that while reading The Book of Zohar we should tune ourselves to one goal or another, and I can’t do that at all…am I missing something by that or should I just keep on going and it will come eventually? Answer: The thing is that if we are talking about receiving a wave and not about the Reforming Light, then among all the noises I should find the exact frequency in which I will hear the silence; the silence is what I need to hear. This is the exact frequency of the station. According to the wisdom of Kabbalah this accurate direction indicates that I am getting ready to receive the Inner Light. Here, however, we are talking about the Surrounding Light, about the Reforming Light, which you don’t recognize when it comes to you. You aren’t working here in order to receive some wisdom, to receive some “station” and to hear something new. You are here in order to activate the maximum desire, and in it you will receive the power to overcome, not knowledge. After all, you are not looking for knowledge here, but for the desire to bestow, to annul yourself before the Upper, to adhere to Him, to His attribute of bestow, to the power of bestowal, to reach self sacrifice, and the ability to actually incorporate in the group in order to receive from it the power to find this upper spiritual mechanism there. You are not tuning yourself to the “station” of wisdom. You don’t wait to be shown something like on a TV screen. This isn’t the channel through which the Reforming Light comes. It comes to the place in which you yearn for bestowal most and are ready to annul yourself and develop your connection with others. This is the result of the Reforming Light, which we should expect. I don’t aspire to understand and to feel the material we study at all. I yearn to understand and feel the actions of bestowal themselves. After all, “to know the material studied,” as Baal HaSulam says in part 155, of the “Introduction to the Study of the Ten Sefirot,” means to know the Upper, and not to acquire knowledge. Knowledge in spirituality is the knowledge of bestowal, and it is in the Light that I study how the spiritual tool works. I won’t see it if I don’t have this approach. After all, what does the Reforming Light bring us? It allows us to relate to the hidden world in which we dwell through the attribute of bestowal. When I begin to relate to the world using the attribute of bestowal, the world becomes transparent and through it I see the networks of connection. It is about these networks that I study, the networks in which I am incorporated, in which I begin to feel like a spider in a web. When I feel the whole system of connection, I begin to correct it, to pull the strings that are drawn from me and to see upon what I bestow. Eventually, this is our whole study: about how I move the whole system and how with its help I correct my actions and work for this system, and how this whole system moves until the Creator, the general force, is revealed. This is why I don’t look for the “station” that should be revealed by The Book of Zohar. But the “static” will gradually bring you to search for another “station,” and you will find it. We start off from the lowest, furthest point. There is nothing further away from the Creator than man. The Creator’s attribute is bestowal, while the created being’s attribute belongs to the inanimate level. There is hardly any difference between the two, except for the fact that the inanimate level is under the absolute control of the Creator and is in 100% self-denial, as it has nothing of its own. Then the levels of the vegetative and animate appear. They are somewhat different from the inanimate level, not in their intentions and desires but in their motion that seems to be opposite from the Creator. The levels of the vegetative and animate grow, move, and develop, and thus grow further from the Creator. They still don’t leave His control, but the Creator simply “allows” them to be incorporated into the two forces and to develop by being under His control. This is why all these levels are called nature. Then the level of man appears and it also goes through the stages of the: inanimate, vegetative, and animate and the speaking. It is in this last level that free will begins. Freedom is a relative concept and it depends on the observed object. We don’t judge stones or trees, but we judge animals, which enables us to train them and thus to use them. Man can already be judged in the full sense. 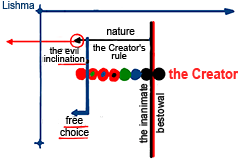 Eventually man finds himself furthest from the Creator; it is so far apart that we call this nature “the evil inclination,” while the previous stages are called nature, meaning under the Creator’s control. So the question is: If most people belong to the natural level of development, how will they advance? After all, we all begin from the inanimate level. In order to do that, there is a special tool: suffering. This tool operates on us and advances us. We associate suffering with a bad feeling, but we should understand that it isn’t just a tool but a whole system that initiates development. Through it, everything develops towards wholeness. So in the next stages, our development is in that direction too, further away from the Creator, according to our free will. In our nature, in the evil inclination, we grow farther away from the Creator, and so we have to draw closer to Him with the help of the intention. Starting from a certain point called “Lishma” (for His sake), we begin to draw closer to the Creator and to enter Him. It is in this initial point of the altruistic intention that we first acquire the real free will, while previously we only had the egoistic substitute. The current crisis includes all of nature’s levels. Recently there was a TV show about natural phenomena that appear as total surprises to people. Among other things, they spoke about an island in the Pacific Ocean whose inhabitants livelihood is based on fishing. Now when they go out to sea they are afraid to get further than a few kilometers from shore. The climate has changed so much that violent storms suddenly appear and it is impossible to forecast them. Very experienced fishermen who have lived their whole lives at sea relate these happenings; the ocean, which they knew so well, has suddenly become a stranger. Such is the scale of the general human crisis. After all, man is the upper part of nature and so he has the most destructive power, much more than all the other creatures. There are revealed and concealed forces in the world. It is hard not to notice the explosion of a bomb. On the other hand, radioactive radiation can only be felt by its effect. There are even finer radiations whose effects can be a total surprise for us. Their source is concealed from us; this is man’s mind power, the power of human desire. We have reached the end of our egoistic development: The world population produces such powerful negativity that we are simply suffocating one another, and at the same time destroying the levels that are below us. They are great in quantity but weak in quality, and we by our qualitative potential can simply destroy them, which is actually what is happening. This is where the “ocean surprises” and many other phenomena stem from. So if it is all about our thoughts, let’s correct them. Kabbalists speak about two ways of development: the good path and by suffering. Apparently at the moment we are advancing by suffering. How can we advance in the same direction in the good way? After all, we have one goal—adhesion with the Creator. This is the fate of all the people, of all the nations. This means that we have to explain to them how to follow the good path, and to adapt to the uniqueness of their development. Man’s mind power is destroying the world. We are causing ourselves and the other parts of nature harm. Today it is possible to openly show people scientifically based examples of this. Therefore, we must treat each other well or we will all be destroyed. So let’s improve our lives with the help of the one force that can help us. If people ask, “So what is that force?”, we will answer that it is the force of the good mutual connection among us, which is actually another definition for the term “Creator.” Today we must use this force worldwide. After all, there is no distance for thoughts, and they don’t weaken as they draw away from the source and reach even the most distant stars, which are thousands of light-years away. What should you ask for? Bestowal. – I want to give out these candies to everyone. At first it isn’t so attractive, but then you learn. At first you will also be allowed to taste from the general box, but gradually you will begin to enjoy bestowal by taking only what you need. This is how the correction is done. We have try to imagine more and more correctly what we see and instead of the externality to see the internality. My teacher Rabash and I used to have discussions about the forces that we saw behind this world’s picture. Once I saw a horse on the street eating from a garbage can, and suddenly Rabash said to me: “Look, this is an angel!” I was surprised because I didn’t see anything but the horse eating the scraps from our meal. The following day I asked him for more information about what he had said, trying to learn how to see the internal forces behind this world. If I see a picture that is focused in my retina or the backside of the brain, then this is how the forces are depicted to me, like on a computer screen, together making up one form. But that form doesn’t exist in itself. I only need it so that I can hold on to something. In fact, it is an expression of an attitude of the one who gives me, who bestows upon me by means of some object. There are three components: the one who bestows, his bestowal upon me, and its impact on me that creates some form. Through that form, I need to return to the one who bestows in order to understand what he wants from me by showing me this form. If I see a horse, what does the Creator want to tell me by showing it to me: what is the combination of forces, what is His attitude to me, what sort of reaction does He expect of me? How do I have to treat this horse and, through it, the one who bestows, the one who is showing me this movie? We have to learn all this. Now we see the world in its external form and not the inner content. This is very helpful and isn’t meant to confuse us on purpose as we usually think. In fact it helps us attain spiritual perception! This is because we have to exert ourselves in order to switch from the external form to the internal form. I promise you that if you begin to “penetrate” into the friends and see the “points in the heart” that are tied together, you will begin to notice that the whole world is arranged in the same way. You will understand that people are not external images, but desires, “packages” of energy. They are all in some kind of a relationship and you can influence them and they can influence you. You will see forces and not bodies! Even today we already treat a person as some kind of force and speak about his essence, but you need to penetrate more deeply. The fact that we don’t see the world in its spiritual form but in its external form, and the gap between the two, always shows us that we haven’t reached adhesion with the environment. The moment we adhere to the environment, and attain the first contact, all this confusion immediately disappears. You see people, but you relate to their essence and not to the external figures. Just like a good psychologist who when looking at people immediately sees their essence, their desires, thoughts, tendencies, and deviations. According to the scientific research, the trend of our development is determined by a general law that develops us and brings us to one form. We will have to achieve connection between us that will allow us to feel that all of humanity is interdependent. Many scientists agree that this is the overall trend of our development. The reason why we aren’t ready to accept this law is because it conflicts with our nature. Each person is accustomed to thinking only of himself and doesn’t understand that he is dependent upon others. However, if a person realizes, feels, and sees with his own eyes that he is dependent upon others, his first priority would be to ensure the well-being of others so that they would do the same in turn! Our problem is that we don’t see how round the world is and the extent to which everything is interconnected. Essentially, this is why we’re in the situation we are today. We are in a state of crisis, which is forcefully tearing us away from the life we’ve become accustomed to in the last few decades. We are accustomed to working a lot, earning a lot, and spending a lot. We produce useful and useless things just for the sake of selling them. We all try to acquire a safety belt: a bank account, retirement fund, medical insurance, good home, and all the things that provide one with a sense of security that he and his children will be taken care of until the end of their lives. This was our goal. Now it appears as though our set-up was incorrect! Nature is breaking all of our plans. Now even rich people, let alone the rest of the population, the so-called middle class and the poor, are unable to obtain this dream. Nature is leading us toward the opposite state where instead of chasing the good life for ourselves alone we would acquire confidence, prosperity, development, and well-being from the connection between us. We are able to see all this thanks to the general crisis, which is breaking all the rules of the past. We are now entering a new era! Accordingly, with the disappearance of the desire comes death. We always live in anticipation of the desired future and not in the present. If there is nothing to hope for in the future, we reach despair, until the body stops functioning and a person dies. So we have to create for ourselves more advanced forms of development. This can be done only by the influence of the right environment. Otherwise, a bad environment, which fills me with bad forms, takes its place, and then I become incorporated in them and want them. For example, I can’t manage without the media. The growing egoism obliged me to get used to them. A thousand years ago everything was different: With the desires of the animate level in me I lived peacefully and without the media. Today I can’t live without television, without the flow of information that floods me. I constantly need to see the future forms that give me the power of life and the feeling of life. What kind of life? We already know…and so we need to build the right environment by ourselves that will assume the role of the media. In this case, I create my future forms by myself, and no one dictates them to me and imposes them on me. This is where my free will is: I choose a better environment that shows me the right forms and directs my desire to the goal, so that it will be balanced with nature, in line with the Creator. Thanks to this I live in the forms in which the Reforming Light is hidden and which later becomes the filling. This gives me the feeling of life until I reach the eternal existence. Gradually my forms draw away from the corporeal discoveries, which can exist only in the corporeal world and I can soar towards the forms of spiritual development. And so gradually, a person moves from building the potential force to attaining the force to execute and begin the spiritual self. Always this is realized by increasing the quality of the desire: I create my future form, my more advanced form, and I am drawn to it, until I reach it and attain it. Question: Does creativity depend on the right contact with the environment? Answer: Power and creativity depend on how much a person identifies more advanced forms of development on his way and discovers the means by which to raise to them. Every instant, like a small child, he looks for new forms in order to discover the world, not this prosaic world, but the hidden mysterious world. After all, in the eyes of a child everything seems mysterious and he looks for new opportunities to discover the world more and more. For him the world is divided into the revealed and the hidden: He sees something and something else he doesn’t notice, he hears something and something else just passes by his ears. Sometimes he catches just a few words of what is being said, sometimes he focuses on something and everything else remains outside his sight. He constantly tries to discover what is hidden from him. This is what we lack…we provide kids with games and the necessary means, and we have to take care of ourselves by ourselves. Our means is the environment, and thanks to it we advance. The environment should be the image of the next level for me. I don’t agree with what I see, but I am incorporated in the group and oblige all the friends to take on newer and more advanced forms. This is all our work.